Excel IF statement with multiple AND/OR conditions, nested IF formulas, etc. In Part 1 of our Excel IF function tutorial, we started to learn the nuts and bolts of the Excel IF function. As you remember, we discussed a few IF formulas for numbers, dates and text values as well as how to write an IF statement for blank and non-blank cells. However, for powerful data analysis, you may often need to evaluate multiple conditions at a time, meaning you have to construct more sophisticated logical tests using multiple IF functions in one formula. The formula examples that follow below will show you how to do this correctly. You will also learn how to use Excel IF in array formulas and learn the basics of the IFEFFOR and IFNA functions. In summary, there can be 2 basic types of multiple conditions - with AND and OR logic. Consequently, your IF function should embed an AND or OR function in the logical test, respectively. AND function. If your logical test contains the AND function, Microsoft Excel returns TRUE if all the conditions are met; otherwise it returns FALSE. OR function. In case you use the OR function in the logical test, Excel returns TRUE if any of the conditions is met; FALSE otherwise. To better illustrate the point, let's have a look at a few IF examples with multiple conditions. Suppose, you have a table with the results of two exam scores. The first score, stored in column C, must be equal to or greater than 20. The second score, listed in column D, must be equal to or exceed 30. Only when both of the above conditions are met, a student passes the final exam. Note. Microsoft Excel checks all conditions in the AND function, even if one of the already tested conditions evaluates to FALSE. Such behavior is a bit unusual since in most of programming languages, subsequent conditions are not tested if any of the previous tests has returned FALSE. You use the combination of IF & OR functions in a similar way. The difference from the IF / AND formula discussed above is that Excel returns TRUE if at least one of the specified conditions is met. Column E will have the "Pass" mark if either the first score is equal to or greater than 20 OR the second score is equal to or greater than 30. More formula examples can be found in Excel IF OR functon. In case you have to evaluate your data based on several sets of multiple conditions, you will have to employ both AND & OR functions at a time. If either of the above conditions is met, the final exam is deemed passed, otherwise - failed. In Excel 2016, 2013, 2010 and 2007, your formula includes no more than 255 arguments, and the total length of the formula does not exceed 8,192 characters. In Excel 2003 and lower, you can use up to 30 arguments and the total length of your formula shall not exceed 1,024 characters. If you need to create more elaborate logical tests for your data, you can include additional IF statements in the value_if_true and value_if_false arguments of your Excel IF formulas. These multiple IF functions are called nested IF functions and they may prove particularly useful if you want your formula to return 3 or more different results. The above formula adds one more conditions - the total score of 70 points and more is qualified as "Excellent". 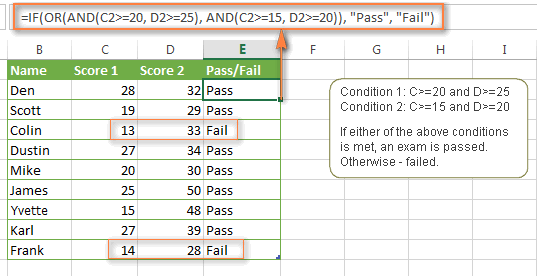 For more information about Excel IF with multiple conditions, please see How to use nested IF in Excel. Like other Excel functions, IF can be used in array formulas. You may need such a formula if you want to evaluate every element of the array when the IF statement is carried out. The formula assigns a certain number of "points" to each value in column B - if a value is equal to or less than 1, it equates to 1 point; and 2 points are assigned to each value greater than 1. And then, the SUM function adds up the resulting 1's and 2's, as shown in the screenshot below. Note. Since this is an array formula, remember to press Ctrl + Shift + Enter to enter it correctly. Earlier in this tutorial, we've discussed a few IF formula examples demonstrating how to use the Excel IF function with logical functions AND and OR. Now, let's see what other Excel functions can be used with IF and what benefits this gives to you. When discussing nested IF functions, we wrote the formula that returns different ranking (Excellent, Good, Satisfactory or Poor) based on the total score of each student. 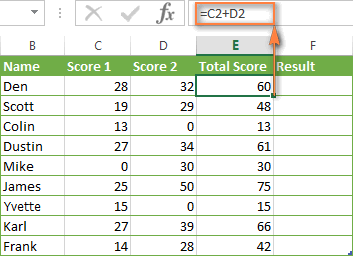 As you remember, we added a new column with the formula that calculates the total of scores in columns C and D.
The formulas retunes "Good" if the average score in columns C:F is equal to or greater than 30, "Satisfactory" if the average score is between 29 and 25 inclusive, and "Poor" if less than 25. In a similar manner, you can use the IF function with your custom worksheet functions. For example, you can use it with the GetCellColor / GetCellFontColor functions to return different results based on a cell color. In addition, Excel provides a number of special IF functions to analyze and calculate data based on different conditions. For example, to count the occurrences of a text or numeric value based on a single or multiple conditions, you can use COUNTIF and COUNTIFS, respectively. To find out a sum of values based on the specified condition(s), use the SUMIF or SUMIFS functions. To calculate the average according to certain criteria, use AVERAGEIF or AVERAGEIFS. You already know a way to spot blank and non-blank cells using the ISBLANK function. Microsoft Excel provides analogous functions to identify text and numeric values - ISTEXT and ISNUMBER, respectively. 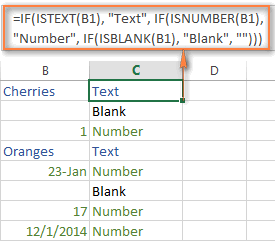 Here's is example of the nested Excel IF function that returns "Text" if cell B1 contains any text value, "Number" if B1 contains a numeric value, and "Blank" if B1 is empty. Note. Please pay attention that the above formula displays "Number" for numeric values and dates. This is because Microsoft Excel stores dates as numbers, starting from January 1, 1900, which equates to 1. 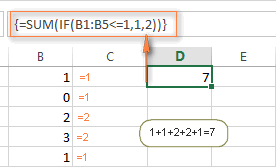 Sometimes, you can achieve the desired result by embedding the IF statement in some other Excel function, rather than using another function in a logical test. Both of the functions, IFERROR and IFNA, are used to trap errors in Excel formulas and replace them with another calculation, predefined value or text message. In earlier Excel versions, you can use the IF ISERROR and IF ISNA combinations instead. The difference is that IFERROR and ISERROR handle all possible Excel errors, including #VALUE!, #N/A, #NAME?, #REF!, #NUM!, #DIV/0!, and #NULL!. While IFNA and ISNA specialize solely in #N/A errors. 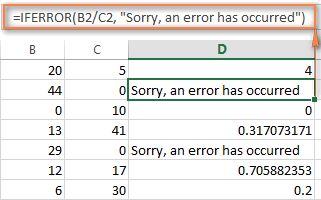 As you see in the screenshot above, column D displays the quotient of the division of a value in column B by a value in column C. You can also see two error messages in cells D2 and D5 because everyone knows that you cannot divide a number by zero. And that's all I have to say about using the IF function in Excel. I thank you for reading and hope to see you on our blog next week! 1,673 Responses to "Excel IF statement with multiple AND/OR conditions, nested IF formulas, and more"
I tried addind ... ,''Analyst'')) at the end of the formula but excel does not take it. Hi Vanessa, use vlookup function. HELP PLEASE! I have a column recording tshirt sizes and i want to minus one from 100 anytime an XL tshirt size is entered in that tshirt size column. So far i have =IF(D1="XL",E544-1). The number 100 is stored in cell E544 hence using E544-1. Note well, it works for only D1 cell. I want it to work for the entire D column. PLEASE HELP. If you are copying the formula, the reference cell will change (eg, E545-1, E546-1, E547-1 and so on. Formula is automatically updated on the assumption that you will want to source data from the next row - so in this case, if you entered 100 in E545 & E546 you will notice that D2 and D3 cells are now calculating correctly). The dollar signs will lock that cell in the formula so it can't change. hi, i need to write a function that tracks progress of a particular invoice through different sheets. I have a main sheet that should show numerical values of 25, 50, 75, 100. I'm struggling to create an iserror (iferror?) formula that addresses the #DIV/0! that results with the formula below. I want to show a blank ("") when the formula results in a #DIV/0! error from the number of days in the month - number of days in the month completed. If the month is completed, this results in a 0, thus, creating the error. How do I just replace the error with a blank ""? B4 is the current date and C3 is the start of the current month. In this example, the current month is January. There are two columns and one is some status and it comes with word and it should be filled manually. The other column should be automatically filled with some assigned marks/ points/ numerical value when the first column status are filled. What is the formula for this? I have a sheet where i need to get data from another sheet where two two conditions are met then only it should take the data. If not it should skip the entire row. I need to get only the values of business A with item status closed. B23 can only equal one value. You are saying IF it equals 24, AND 30, AND 36, AND 48, AND 60. That is obviously false since none of those values equal each other. Also, why do you have so many closed parentheses at the end? I need the output for this particular string to read '1' because the count is reset as the 11th number is over 1%. This particular string should output 5 because the count restarts after the 7th number exceeds 1%. Hi, I am trying to find the right IF function but can't quite get it. If A1 is greater than or equal to 9, and B1 is zero, then A1 minus 9, else sum of A1+B1. But no matter what I try, it doesn't work. the result is always either deducted or added by 9. Only the value in A1 should be deducted by 9 if its =/> 9. Value in B1 stays as is. Can you please help? thank you. but if A6=2 show Y otherwise show nothing ? If the Time is between 07:00:01 and 15:30:00 then I should get output as "Shift 1"
If the Time is between 15:30:01 and 00:00:00 then I should get output as "Shift 2"
If the Time is between 00:00:01 and 07:00:00 then I should get output as "Shift 3"
Hi I have one doubt. I need formula for the below condition. I submitted this questions previously but don't see it here. Let's try again. I wrote this formulas but it's returning #value!. That may be because it's a mix of text and number qualifiers. Any ideas? I need help setting up an IF formula. I am trying to track my blood pressure, and I want it to display whether the readings are "High", "Elevated", or "Normal". I am recording each number in a separate cell, so I have the Systolic readings in the "B" column, Dystolic in the "C" column, and "Pulse" in "D" column. I want the "E" column to throw back "High", "Elevated", or "Normal" if both "B" and "C" columns meet certain criteria. That should be similar to what the example above is using. OF course, substitute the example numbers I used with the actual numbers you are using. I have a spreadsheet that contains money spent on different vehicles in the company. I would like a formula that would add costs in one column if its a particular Vehicle listed in another column. I would like a grand total of what is spend for each vehicle. I need to get the value of last week's report copied into this weeks report. One client can have 1, 2 or 3 types of funding. Column F: The client's risk value. What I need is a formula for column G to look within all the data set for a matching client (of client in column D), and then display the value for last week's risk IF the type of funding matches. Hi I have a problem and hope someone can help. I want a cell to increase in percentage depending on what the other cells percentage is. This is what I have so far but it only works for 8%, 11% and 15% but not for the rest of the formula. 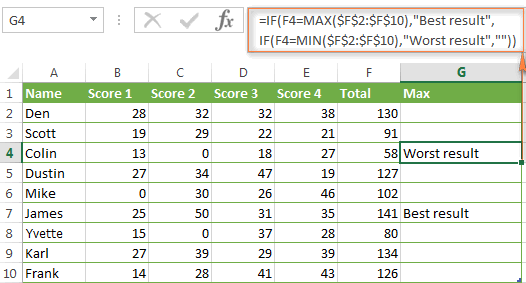 I want to write formula in excel to increase the cell value by 4 but if sum exceed to more the 10, same will be reduced to maximum 10 as 10 is considered as maximum values. and it is working all over the spreadsheet. now I want to add : if J3 has no date, what do I have to do to the formula to have the status column be "none"
( Result is Absent Days). I have problem with application of % formula for student concession. My school data has unique parent numbers(repeating itself if he has more kids studying). If a parent has more than 2 kids he is charged 75% and on 4th onward 50%. Concession criteria is first given to lowest class to highest( I have classes 1-12). If any idea for solution it will be great. I'm trying to do an IF(AND multiple times but the results continue to come back as #N/A. I know they are correct because I have individually taken them out and tested it line by line. Is there a correct way to structure this? I would appreciate any help on this! Thanks. Could you please help by which farmula suould be used to count total for many currenceies not in order in one sheet? I want column A to reflect the sum of all amounts (Column F) associated with each account number (column C) from all rows that include that account number, and not include those with a different number in column C. I cannot figure out how to write a multi condition If formula for this. I have made the right formula for the 1st rows..but when I tried to copy it to other rows the result is different I tried using.thesame values to check the result is different. if we type a same name in difference character i.e muneer , munir" the how to identify it in excel. because it is same name but differ in character. If % change is greater than + or - 20% AND $ change is greater than + or - $20,000 then Yes if not, No. I can't seem to get the formula right to capture the +/- for % change and $ change without it picking up everything. Hi. I need a way to determine if members in a household satisfy certain conditions. Forexample I have mutliple households, each with multiple members and I need to determine if anyone in each household earns above a certain amount. If cell B4:B40= "Amy" and cell c4:c40= "Rich" and cell d4:d40= "Done" then "Done". Note that number of "On process" has but only one is "Done". If all "On Process" found show "On Process". If just one "Done" found with number of "On Process" then show "Done". Sorry if this has been asked already. I did try to scroll through to find the answer. I put information into columns K and L. If I put something I to column A, that matches column K, I need column B to pull it from column L. Does that make sense? I know it's an IF, but is it more than one? How to make a formula, If column B is less than column A you must add 24 plus column A ( in a new column). I want to know how to create a formula that "if the value is greater than 1 then use "this" formula, otherwise use "that" formula"
How to check invoices has been paid or not in excel file. if i have paid invoices details. I have the date in one cell and in the next using the text formula it just shows the year and month. when I drag this formula down the colum I want it to be blank until I fill the necessary cell - can you help me with the formula. I have had a stab at it but not sure if I am even starting in the right place! Hi I am looking to pull a value from a row but if there are more than two values in the row then needs to show error, and the only values that should be there are a "Y" or an "N". if there is another value besides a Y or an N then it needs to pull an error. This is what I have so far but its not working. If Sheet1 A2:A20= Jim AND Sheet1 B2:B20= dolar AND Sheet1 M2:M20= Paid Then M2= " Full Paid"
If Sheet1 A2:A20= Jim AND Sheet1 B2:B20= dolar AND Sheet1 M2:M20= Not Paid Then M2= "Partially Paid". I want to sort out finally who is Fully Paid or Partially Paid to another sheet. Please help me to short out this. I am trying to make a formula to pull students that passed all classes. So it would only pull Fred. I have 3 columns of data that I need to return a single result for. I need only the value of the first column to show is the 4th of Column, or if A is blank but B has a value then I need B's value in the 4th colum and so forth. I need only 1 value to be returned so A first then B or C otherwise it needs to be blank if it does not have one of those values. And the funding is first 50 million from equity, next 100 million from debt and 200 million from mezzanine debt (NOTE : WE CAN USE THE 100 MILLION ONLY AFTER WE DEPLETE THE FIRST 50 MILLION. SIMILARLY, THE NEXT 200 MILLION AFTER THE FIRST 100 MILLION. DOES ANYONE KNOW ANY EXCEL FORMULA/CONDITION FOR THIS?? Hi! I'd like to check 3 different conditions at once in excel, each consisting of 2 checking cells. e.g. If U>=0 and AE>0 then AE, or if U0 then +X+AE, or if U>0 and AE<=O then 0. Any clue how to do it? Thanks in advance! I'm trying to create a column based off a date/time column "5/1/2018 6:37:50 AM"
If the date and time is after 6:00:00 but before 18:00:00 I would like the result column to post "1-MAY-18 D" however if it falls after 18:00:00 and before 6:00:00 on the next day I would like the result column to post "1-MAY-18 N". I have used and IF(AND statement and been able to classify each as whatever I choose but I cannot figure out a way to retain the date. What I have used is " =IF(AND(HOUR(A1)>=6,HOUR(A1)<18), “dayshift”, “nightshift”) "
but this doesn't give me achieved result of retaining date but splitting by Night or Day. Any Suggestions for a novice excel user? I want a formula, if I putted any value in "A1" then B1 cell it should show value from next sheet for value next to value in A1 cell.eg. if if put 86318 in A1 Cell then B1 cell should show as "Inhouse", which is mentioned next to 86318 in another sheet. An excel has got nearly 3 lakhs entries. Need a code that it should sum up the values in a single column till range 700-800 and produce the total value in next column. it should move to the next cell once it exceeds the value of 800 and perform the same function as mentioned above. 2. if component A is equal or more than 15k, Z is 12% of A.
Shall await for a response. Thanks in advance. Kindly provide the applicable formula for this below condition. I'm trying to bring to formulas together but having a time making the one formula work properly. I know I can add a comma between the two, but when I do the formula only partly works. The overall objective is to have the "# of Days" (column "D") calculate the number of days between column "C" and TODAY's date. However, if there is another date in column "E", then I would like column "D" to reflect the difference between the two date fields column "C", and column "E". Cell O1 has in it "-43578", because this is the default value that shows up in the "# of Days" field when there are no dates in column "C", and column "E". Hope my explanation makes sense? I just need one formula that will allow for me to perform the above function.